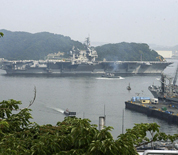 Yokosuka Naval Base, officially Commander U.S. Fleet Activities Yokosuka (CFAY), is in Yokosuka City, Japan and located about 30 miles southwest of Japan's capital city, Tokyo, on the east coast of the main island, Honshu. It is an industrial and residential community, with an area of about 39 square miles, and a population of about 422,441. This 579 acre naval base occupies a small peninsula jutting into Tokyo Bay. A Navy Munitions Command in nearby Urago, and off-base housing areas at Negishi and Ikego comprise another 850 acres of U.S. facilities. As the home of the U.S. Navy's Seventh Fleet, Yokosuka Naval Base, often referred to as CFAY (Commander Fleet Activities Yokosuka), hosts 13 afloat commands and more than 50 other shore commands and tenant activities. CFAY's primary mission is to provide support services to forward deployed naval forces in Yokosuka, and other units assigned in the Western Pacific.